Day 2 of Camp is all about animals, baby animals and mainly farm animals. Here's my lesson ideas/plan for the day. It's more based on grade 3 and 4 but I may use it for grade 5-6 at another school and add some more difficult activities. one, two, three, four, five, six, brown, red, black, pink, green, yellow, foal, calves, kittens, piglets, ducklings, puppies. "One brown foal is ready to play." Activity 1: Warm up - Match the babies to their Mommas. 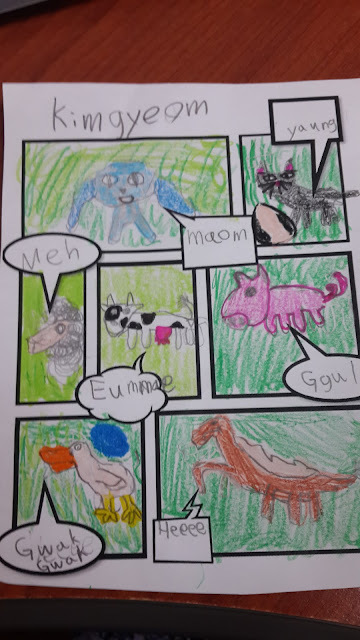 Picture flashcards of baby animals and their mothers. The students must match these up correctly. I cannot give these cards for free as they are Twinkl.co.uk property but here's the link to download them. I suggest you join the Twinkl site! It's awesome. 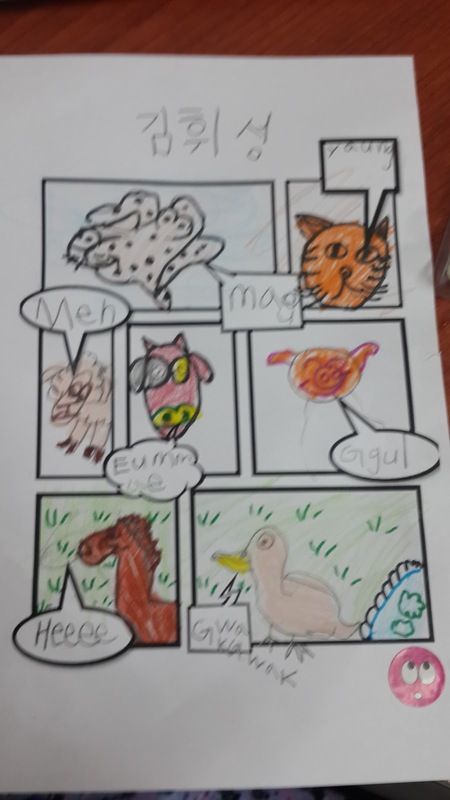 We will read the new words and go over them with the students. More a warm up than anything else, low pressure activity. Activity 2: Read the Book! There's an online reading version if you don't have the book. 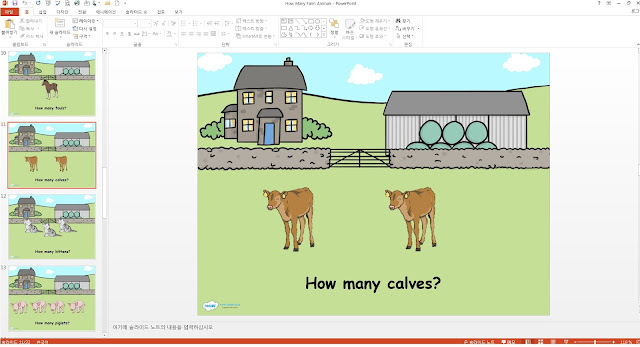 Go over the vocabulary with a powerpoint and powerpoint game - How many animals are there? I adjusted this to match the book, the original doesn't include baby animals. The powerpoint has animations that make the animals disappear from the screen quickly and the students have to count as quick as they can. 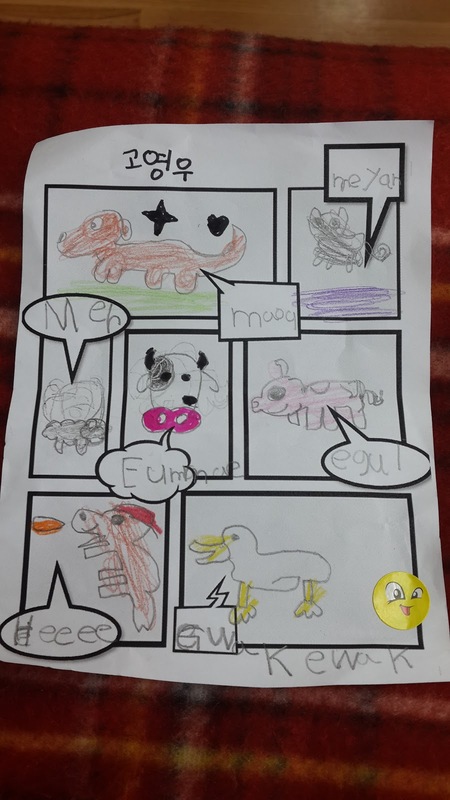 If they can guess the correct number of animals on screen they earn a point (or bragging rights, usually don't need points). Practices new vocabulary and counting well. 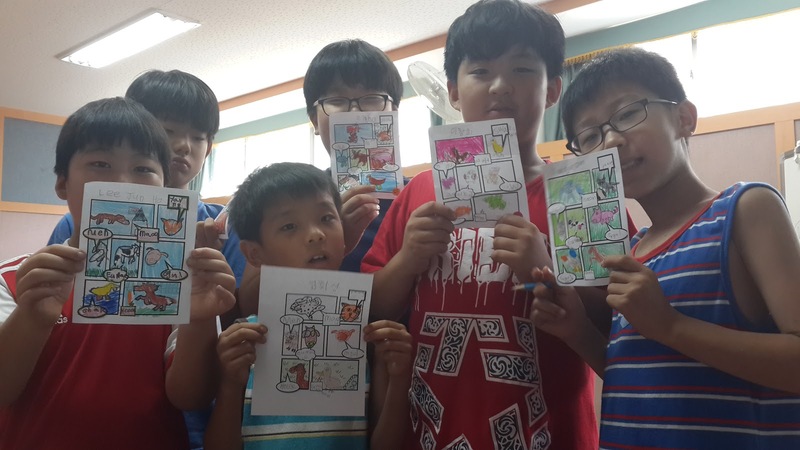 Activity 4: How do you say it in Korean? 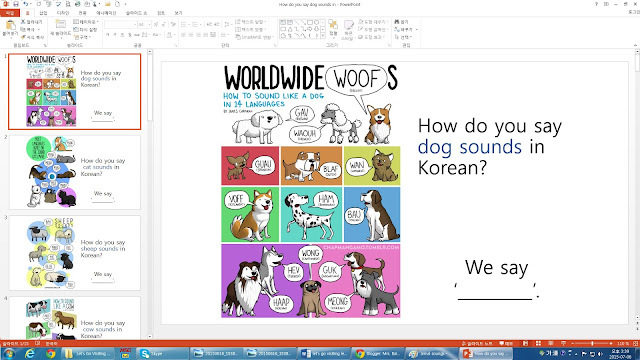 This is a wonderful part of a PPT I found on Waygook ages ago. It's this cool comic strip that has all different sounds of different things, such as animals, and what other languages use for said sounds. It's such a fun activity ! 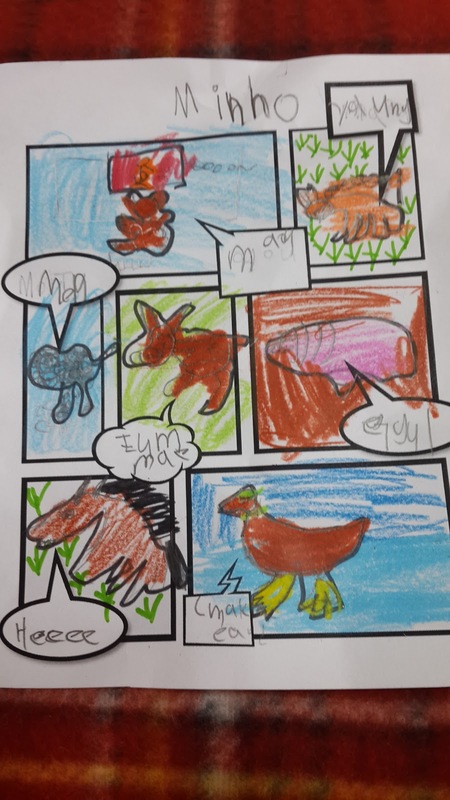 Kids love to tell me their animal sounds and hear other languages. 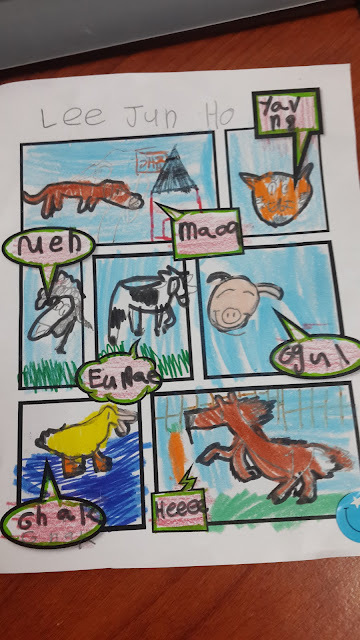 It would be great to see the baby animals they learnt in there, but encourage other animals they know as well and help them sound out the 'sound word' (onomatopoeia) using phonics and alphabet to review. Update July 28th : Here's the great comics that my grade 3 and 4 made! Activity 6: Watch the Video - this is really funny and in Korean as well as English. I think it's a fun watch after they make their own comics. I found it a while back, it's made by a funny YouTuber named Dave. This is a fun way to practice the numbers and counting. They roll 2 dice and then add the numbers they get together. Next, the have to color the number that is the answer. E.g. They roll 2 ones. Then that equals 1+ 1 = 2. So they color one of the 2's on their worksheet. They play with a partner. The first to color all wins. So they should use one color crayon each. Activity 9: Puppet Shows, record and perform. "Let's go visiting, what do you say? One brown foal is ready to play." "Let's go visiting, what do you say. One grey mouse is ready to play..." and so on. 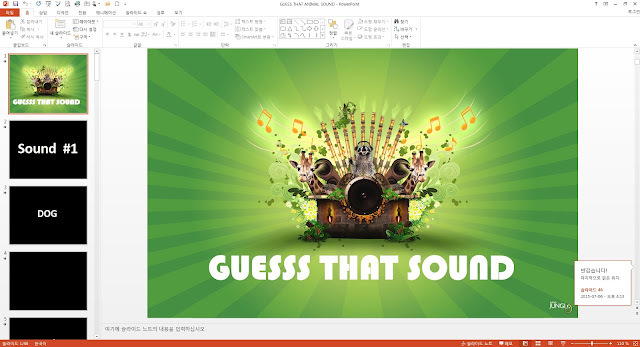 A sound game I got from Waygook. The students listen to an animal sound that plays within the PPT and have to guess. Some new words are sure to come up such as rooster, parrot, whale and more. A nice way to review and learn some new animal names also. It's such a cool powerpoint, thanks so much to the original poster! This bomb game features a Mr.Bean short video link - the episode where he enters Teddy into a dog show, and wins. Should make the kids laugh a bit. 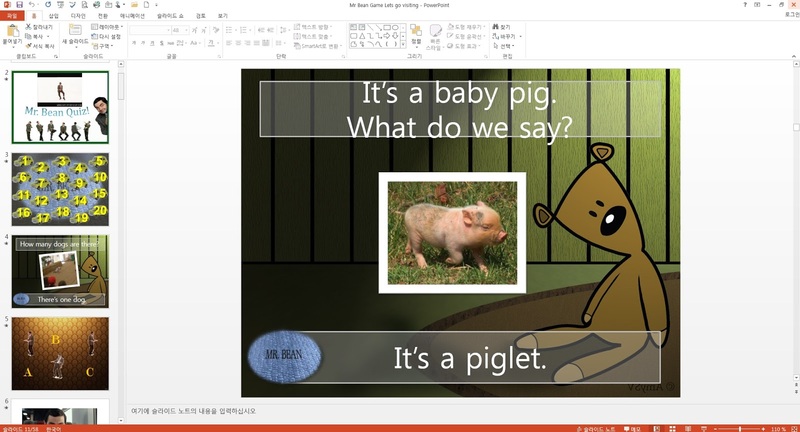 Then the game quizzes them on the baby animal vocab they learnt in the 'Let's Go Visiting' Book as well as some of the video of Mr.Bean shown in the beginning. 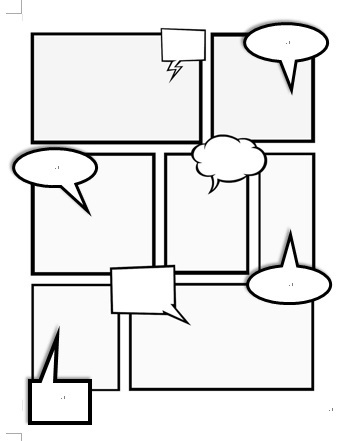 I found the template on Waygook also, thanks to the original poster, maker - it is lovely. I also found this farm matching card set for free, if you'd like to make use of it. 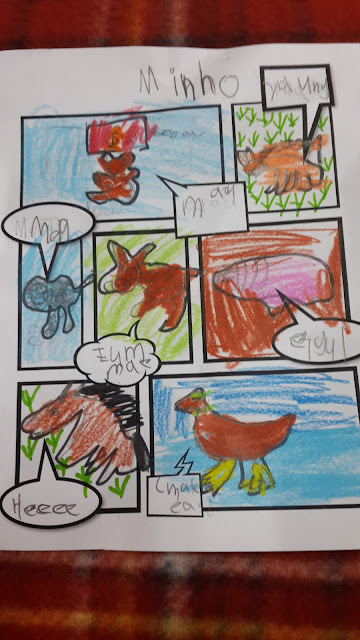 It's more a animal revision than baby animals but fun for the wee ones as you can colour as well. It's from this great blog called 1plus1plus1equals1 which has a lot of free downloads and lesson ideas.